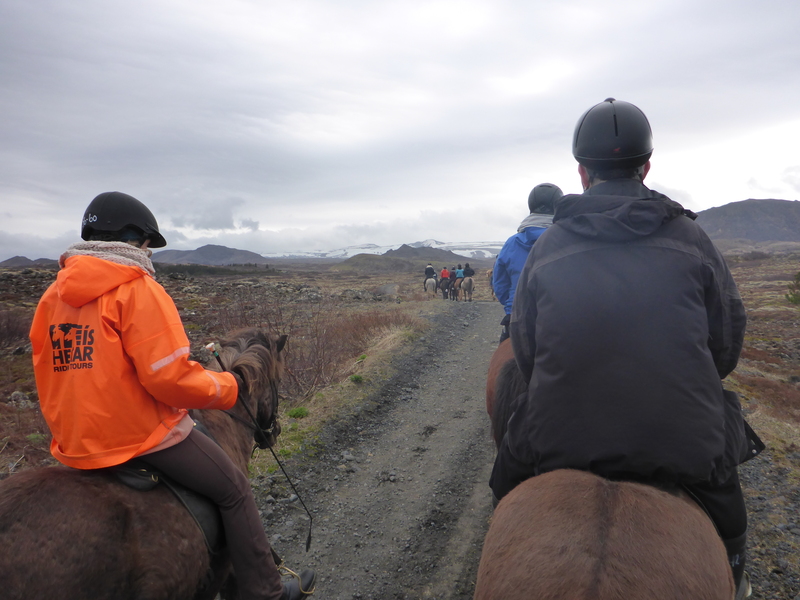 Today we’d booked into an Icelandic horse riding tour. The rest of the family love horse-riding but I’m always a bit wary of anything involving living creatures (or “random behaviour simulators”, as I describe them). But Icelandic horses are different to the ones we have in the rest of Europe so I was a bit curious to try them out.Unfortunately “different” still meant no steering wheel or joystick. My horse was a solid steed named “Silver”. I managed to resist Lone Ranger impersonations as we were told not to frighten them. After getting on we he headed on with the tour in single-file (to hide our numbers). The horses were smaller than the ones in the UK but quite heavily muscled. They also coped with difficult terrain really easily, partly by having an additional gait that other horses don’t have (the tölt). I spent most of the initial part of the ride trying to remember the instruction video (back straight, thighs together, heels out, heels down, reins low etc etc). After a while I realised my horse knew what he was doing far better than I did and I got a chance to enjoy the view. It was spectacular and a good chance to see Iceland away from the roads. There were no real problems; I ate a Mars bar one point to keep my blood sugar up and Silver apparently knew only too well what the noise meant. As I was standing by his head holding the reins at the time he started devouring everything connected to me within range of his head; sleeves, coat, hand etc. To be fair, I could empathise. In fact I couldn’t help but notice that the horses we all had reflected our personalities. Mine was ultra-competitive (he kept overtaking people before I got the chance to rein him in) and would eat his way through a wall. My youngest had a horse that did random things and wouldn’t hear any instructions counter to whatever it was up to. My eldest had a horse that was barely away and would move fast unless practically carried. And my wife’s trundled off on it’s own and tried to stay as far above the chaos of the rest of our horses as possible. We had no problems putting thee horses away and we got back to town in time for a late lunch (it had to be fast as it was so late so we were forced to eat hot-dogs again. It was a medical emergency). 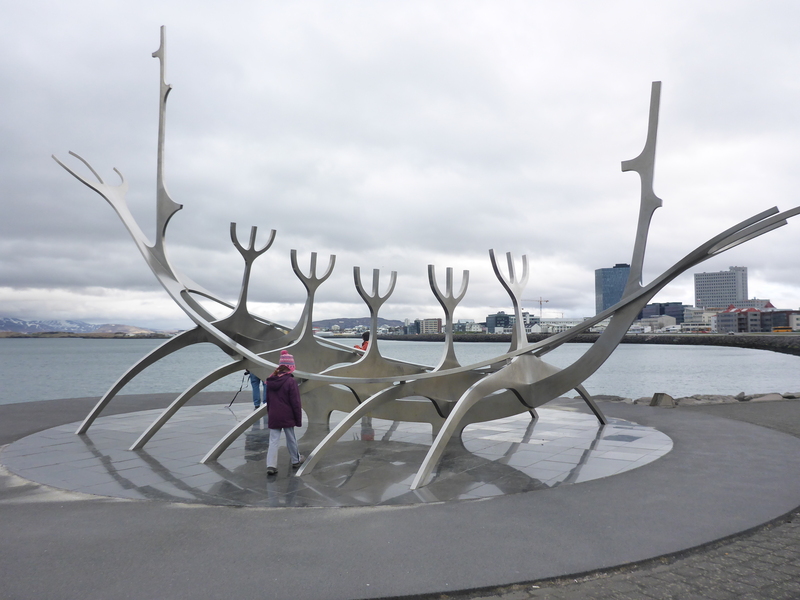 On the way we had a bit of a wander around the harbour area and saw a cool sculpture of a longboat. Back at the hotel we all had a bit of a relax and plenty of hot showers to stop any stiffness and we finished the day with freshly-caught fish and more skyr. Very nice! XCOM Update : It’s all gone horribly wrong. Loads of panic due to satellites being shot down and the first encounter with Mutons dissolved my poorly-equipped team. Sigh. Started another new game.